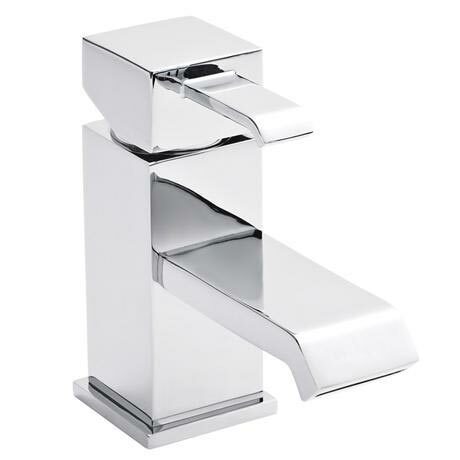 The Blake waterfall mono basin mixer from Ultra, a modern minimalist basin mixer characterised by its square body, slim lever handle and sleek waterfall spout. Constructed from durable brass with a quality chrome plated finish. Comes with 5 Year guarantee. The cool and contemporary Blake waterfall mono basin mixer is the perfect complement for any basin. It delivers the ideal mix of stunning design and superb function. It creates a beautiful waterfall when in use which can help make the bathroom a tranquil paradise. Made from a brass interior to give it strength and finished in polished chrome to give it style. "Lovely shaped tap, looks more expensive than it cost. Fits onto the chestnut sink unit a treat."